Federal and state laws require aggregate and other loose loads to be controlled at all times. That means if you are driving a dump truck or a tractor hauling an open top trailer, you have the responsibility of making sure that whatever you are carrying stays inside its box while you travel down the road. The best way to accomplish this is with a vinyl truck tarp. 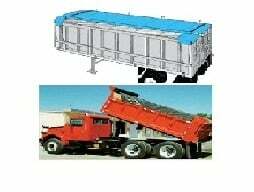 Our role and vinyl flap tarps are ideal for dump trucks and open top trailers because they are custom-made for this particular purpose. Each of our heavy-duty tarps fits neatly over standard sized boxes and can be utilized with roll or flip tarping systems. Each is made with premium waterproof vinyl and reinforced webbing to guarantee maximum performance load after load. Don't take any chances with your aggregates or other loose loads; cover them with a tarp from Mytee Products.